TWITTERING THE DEAD: Paranormal Communication Hooey! You know that's not true. Hooey! You know that's not true. Is it? True paranormal perfection is losing sight of yesterday and it's problems. In paranormal research it's finding a ghost that hasn't. In the last 15 years or so, as a society we have had access to more information than ever before in modern history because of the Internet. There are approximately 3 billion PLUS Internet users in the world and any one of these users can theoretically communicate in real time with any other on the planet. Ghost communicate to us with their emotions. Except for those psychics, mediums and Necromancers out there. Only a lone few can communicate with ghosts and carry on intelligent conversations. The Internet has been the greatest technological achievement of the 20th century by far, and has been recognized as such by the global community. The free transfer of information, uncensored, unlimited and untainted, still seems to be a dream when you think about it. Whatever field that is mentioned — education, commerce, government, news, entertainment, politics and countless other areas — have been radically affected by the introduction of the Internet. And it pro bally won't be to long before someone is claiming that a ghost is (ohh... God!) twittering or emailing them. Using Twitter is going to change the way you think about staying in touch with DEAD friends and family. Did you know you can send and receive Twitter updates via mobile texting or the web? Hooey! You know that's not true. Or is it? People over the centuries have said they have spoken to ghosts on the phone, by Mail, telepathy, Televisions, Radios, computers etcetera, etc..
Is the Dead twittering you the next big head line in the paranormal news? My question is who do we or don't we believe? Will you attack their opinions? Could twittering your peeps from the other side the new trend in Technical Seance. If you want to call that strange how about a certain well known ghost hunter who use to sit around with their friends and listen to Spirits guiding our lives in the dark. I'd prefer to twitter with the ghost in the machine rather then fight a demon in the dark anytime. Wouldn't you? 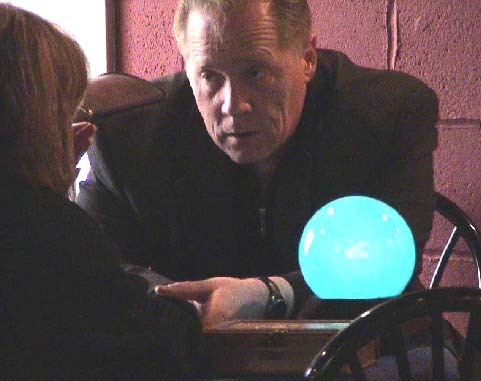 Recently I had a very interesting discussion with Psychic Reese Smith. He believes that glitches in time, space the internet, Telephone, Television or what ever or actual spirits and ghost twittering us for attention. "You know he might just be right!" Said Smith. "I got twittered from Ghostbusters 3 just the other day." "I don't know who they are, and telling me that his secret is reveald!" Smith like others have turned more to Techno Seance's whether your Lisa Lee Harp Waugh The Necromancer talking to the dead on dead cell phones or a Frank's Box. Or Greg Myers using an Olivus. Want to know what Einstein was building to communicate with the dead? In my opinion it was a communications system that people had to only think into and the voice talked back. Could that be what twitter will be next if Yahoo, Google or anyone develops it, and we buy it? In time we will have people using Twitter just to hunt Ghosts with! Or the best ghost hunting article about the real haunted i phone. Or how to hunt for real ghosts using Twitter! I recently got an email from a person who claims a friend she had recently died, and is now twittering her from the other side. I sat and thought about it for a while and thought what are the odds of this occuring. Ghost use phones, emails, instanmesages, texting and EVP's to communicate who says they can't twitter. My curiosity is really up now, and I hope yours is too. If you are twittered by a dead person or twittering with someone known to be dead. Then please let me know. and we will investigate it together. Twitter was funded initially by Obvious, a creative environment in San Francisco, CA. The first prototype was built in two weeks in March 2006 and launched publicly in August of 2006. The service grew popular very quickly and it soon made sense for Twitter to move outside of Obvious. In May 2007, Twitter Incorporated was founded. Why do so many people seem to like Twitter? Simplicity has played an important role in Twitter's success. People are eager to connect with other people and Twitter makes that simple. Twitter asks one question, "What are you doing?" Answers must be under 140 characters in length and can be sent via mobile texting, instant message, or the web. We continue to follow user behavior and pay close attention to feature requests. We launched our mobile site, m.twitter.com after getting lots of requests for this feature. However, we are also very much guided by our philosophy of keeping things simple and intuitive so we like to restrain ourselves with regard to features. That being said, people seem to be calling for more interesting ways to share feedback with one another and organize themselves and their updates into groups--we're paying attention to these requests. We plan to build Twitter, Inc into a successful, revenue-generating company that attracts world-class talent with an inspiring culture and attitude towards doing business.